In the creative game mode, you have the ability to play maps created by other players. In order to do this, you can either try out the featured maps in the creative hub, or you can play specific maps using map codes. A map code is a 12-digit code that allows anyone to access a saved island. This means selected players can share their creation with the community. Anyone can, however, share their own creation with their friends by playing on the same server. To use a creative code, go to one of the rifts in your creative hub, and press interact. A screen will now appear. In the top right corner of this screen you can put in a code. Put in the desired code and press select island. Once the creative map is loaded, walk into the rift. Once you’ve made it to one of your own islands, you probably want to make a chest. This chest can contain any combination of items you want, and will respawn every time you press start game on your island. You can add as many items to the chest as you’d like. If you wish to remove an item from the chest, go to the “Chest” tab and select the item, then press remove. When you are happy with the items in your chest, go to the “Chest” tab and press “Create Chest”. Your custom chest will now be created in front of you. 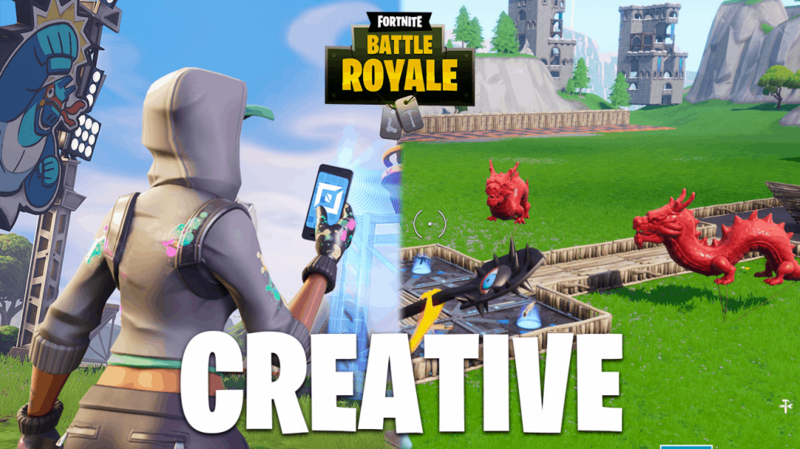 The phone item in creative mode, is used for building. With the phone, you can select prefabs, blocks or any other building piece and place copies of the selected item all over the map. In order to use the phone, select it, then left click on the piece you want to copy. Once your phone has selected the desired piece, you can left-click anywhere to place the copied piece. To deselect your selected piece, press right-click. Prefabs are pre-built structures, buildings and objects found throughout the Fortnite world. These prefabs can be accessed and used for creation by spawning them on the ground. To spawn them, simply open up your inventory, go to the “creative” tab and choose “prefabs”. Find whatever prefab you wish to utilize and press equip. You now have an item that can be thrown on the ground like a port-a-fortress. Once it hits the ground, the prefab will be spawned. You can use the mobile item to copy pieces of prefabs in order to create something great. Some people have found themselves “stuck” on their own island or a map creative by the community. To get back to the main island, also known as Creative Hub, simply press Esc, and click on “Back to Creative Hub”. If you want to start building on your very own creative island, you have two options. You can either use the classic building pieces you know from Fortnite (Ramp, Floor, Wall, and Pyramid) or you can use the mobile. Using the classic structures is the exact same as you’re used to, you just have infinite materials. If you choose to use the mobile item, you can use any structure from the game, by utilizing prefabs. Both the mobile item, how to use it and how to use prefabs have been described earlier in this guide. If you want to let friends build on your creative island, you to give them permission. In order to give them permission, simply press esc and click on “My Island”. A “My Island” screen will pop up. Click on the “Island Tools” tab and set “Island Edit Permission” to “Everyone” instead of “Only Me”. Everyone will now be able to edit and build on your island. If you want to practice building, play matches with your friends, or something third, you might want to disable flying. To turn flying off, press Esc and click on “My Island”. Under the “Game” tab, click the green “Start Game” button. You will now respawn and will not be able to fly. To get back, simply open the same menu, and press “End Game”. There are two ways of joining a server. The first way is simply by being in the same party as the one creating the creative server once he creates it. However, you can also join a server that is already running. To do this, choose “Creative” game mode on the main screen. Then press play. A screen will now pop up with all the servers your friends are running, or your friends’ friends are running. You can also choose to start your own server if this is what you wish to do. When you’ve found the desired server you wish to join, press “Launch” and wait. The creative mode is quite slow, so be patient. Sometimes, you will get an error message which means the server is no longer running, or that you are unable to join. Creative mode is still in an early stage, so glitches do occur. To turn off fall damage, press Esc and then click “My Island”. On the window that pops up, press the “Game Settings” tab. Under this tab, locate the option “Fall Damage” and set it to “Off”, then press “Apply”. The same method is used when you want to turn on fall damage. To turn off re-deploy, open up the “My Island” menu by pressing Esc, and clicking on my island. Press on the “Game Settings” tab and scroll down. Once you find the option “Glider Redeploy”, set it to off and then press “Apply.” This is the same way you can turn on glider redeploy. Just set it to On instead of Off. To turn on infinite ammo open up the “My Island” settings, by pressing Esc and choosing my island. Go to the “Games Settings” tab and find the infinite ammo option. Set this to On, then press apply. If you wish to turn infinite ammo off, simply set it to off. If you wish to enable or disable infinite materials, press Esc and open up the My Island settings. Under the game settings tab, you will find an option called infinite resources. Set this to on if you wish to have infinite materials, then click apply. To turn off this feature, simply set it to off. Once you’ve built your very own island, you probably want to actually play it. In order to do this, you have to start the game. Press the Esc button and go to My Island and press Start Game in the bottom right of the menu. Setting new spawn points on your creative island is very convenient. To set new spawn points, use the device “Player Spawn”. This device is found by opening your inventory, clicking on the Creative tab in the top of the screen, and then choosing the Devices tab below. Here you will see all the devices available to you. Go ahead and click on the Player Spawn device and press equip. You will now have the device in your trap slot. Place this player spawn trap (device) anywhere on your island. You can even place multiple spawn points. Make sure spawn location is set to spawn pads under My Island settings. You can customize player spawn-devices once you’ve placed them by pressing interact on them. We’ve put together a selection of different creative map code lists. Below, you’ll find lists everything from Call of Duty map codes to warm up course codes.